Twenty-four Focusers gathered from February 9 to 16 at a beautiful, sacred site below an ancient volcanic crater on the Pacific shore in Chacala, Mexico. Our retreat center was tucked into a golden crescent beach adorned with black lava rocks the size of dinosaur eggs. None of us had ever been to the Mar de Jade retreat center, and none was disappointed. Practically every room looked out on the ocean – in fact, sometimes we had to close the doors because the waves were so loud! The unfailingly friendly staff provided three delicious buffet meals a day with organic vegetables from their own farm, and something to meet absolutely every dietary need. The first two days we were there, a group of whales put on a lunchtime show off the outdoor dining patio. We were a diverse group of Mexicans and North Americans with anywhere from one week to 25+ years of Focusing experience. Some came to soak up all the learning they could; others simply to bask in the sun and the resonance of Focusing community. The facilitators sought to meet this range of needs by making it clear that all activities were truly optional and inviting attendees to follow their felt sense in choosing what they most needed hour by hour. 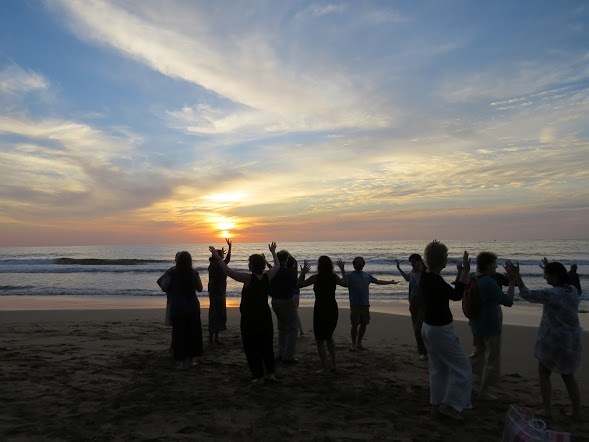 Accordingly, many attendees managed to work at least one massage into their week; and the original schedule organically evolved to include a daily cocktail hour as the sun set into the ocean. Every day began with movement – before breakfast, a tai chi class; and after, creative movement exercises as a form of group attunement. Morning classes unfolded a theme of positive psychology, and afternoons included optional creative activities such as a workshop on “the felt sense of swimming” held in the sea. On the second-to-last morning, Focusing Institute Mexico sponsored a group excursion to an ancient sacred petroglyph site to make offerings to the land that had hosted us, with the guidance of an indigenous shaman. Stay tuned for the possibility of a 2014 Winter Focusing Retreat.